Feed Station: Jam and cream scones and a cup of tea. 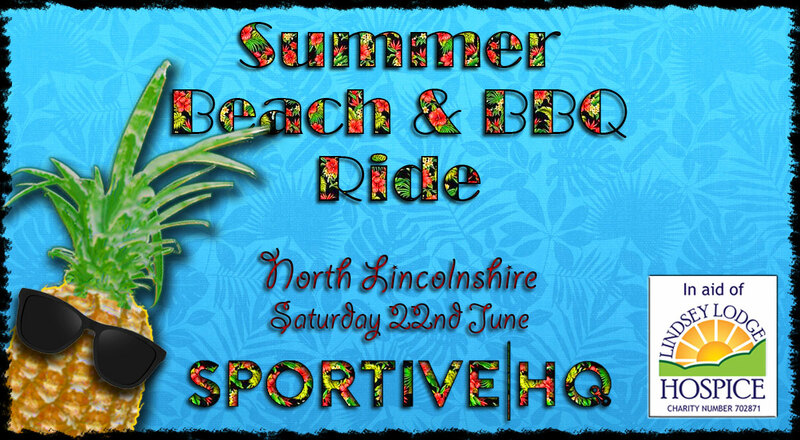 After the massive success of the Festive Fifty in North Lincolnshire and Yorkshire, The Summer Beach and BBQ Ride edition has been launched to raise more money for a great charity, Lindsey Lodge Hospice North Lincolnshire. In the same way as the original event, fund raising is higher the more people we get to to ride so invite your friends, share the event with friends and just get everyone you can to sign up! Being a Summer theme ride Hawaiian shirts and beach wear is optional, (no swimsuits) this is fancy dress and prizes will be awarded for the best fancy dress. So join in with the fun! So what is it all about you may ask. Being a summer ride, it starts later on the road. 12:30 Ride Starts – choose from either the 50 mile or 30 mile route, it’s not timed just fun! Feed stop at Kirton in Lindsey where you can get jam and cream scones and a cup of tea. Make sure you get back to the finish to enjoy a Summer BBQ – Burger or Sausage and any drink you like from the bar! It’s a really big social and a great fundraiser! Within the entry system, you can choose to buy a Tech T-Shirt as a souvenir from the event, where another £3 donation is made per T-Shirt to the Children’s Heart Surgery Fund! Don’t forget to get your outfit sorted. Let everyone know you're going!